September 10th, 2013 Since last post in Puente de la Reina > Ventosa (84km) 52.6 miles. I got my first blister. It’s just a simple one between my middle and second toes. Flip-flops are a blessing in the afternoons. I had to learn to lance the blister with a needle, clean it, use the proper antibiotics, and apparently also tighten up my shoes. It becomes a daily routine, just after the showers happen. Have I mentioned what a wonderful time the showers are? I have re-learned the brilliance of a great shower. After the mass bathing situations that happened in the first few albergues, its less of an ordeal and I usually don’t have to stand in line. Wonderful soap smells fill the bathrooms. Sometimes there are women’s bathrooms; sometimes men and women share the bathrooms. As Peregrinos, we learn to remember the simple pleasures in life. 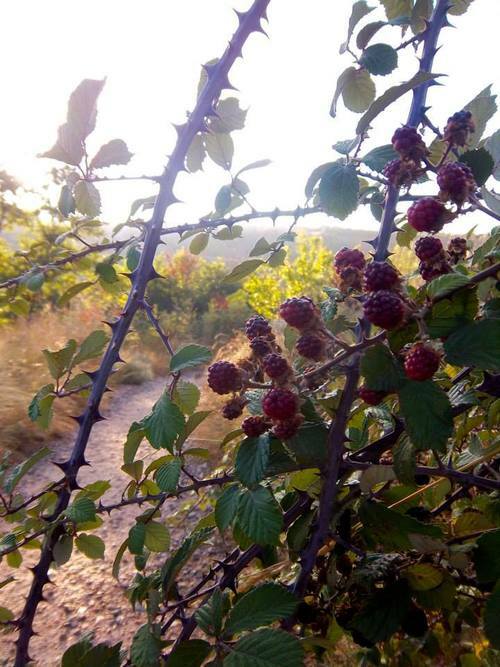 Berries, free foods. The roads for us are lined with berries, wonderful, edible antioxidants to snack on throughout the Way. I call them the snack of the Peregrinos. We snack on fruits and vegetables all day. It seems to be a recurring theme, an apple around 10pm after we’ve hiked a hill or two, and a nectarine around noon, before we find our lunch. I mean, when I am staring at lush, ripe grapes all day, I have to find something to sink my teeth into to avoid the temptation of sampling the local grapes. Today Kent and I had planned to make it all the way to Najara, some 30 km (18 ish mile) day, but, along with a late start, we were physically exhausted by the time we reached a town called Ventosa. Here, there is one privately owned Albergue called San Saturnino, and one restaurant. In Ventosa, only a truck that comes once a day with groceries provides the food, aside from their own little restaurant. It honks to make its appearance known in the town. And arrives in the street just as the weary hikers arrive and leaves as soon as there is no one else. We loaded up on breakfast foods for the following morning as soon as it arrived in Ventosa, bought a baguette and sat ourselves in the warm Spanish sun that was threatening to be overcome by clouds. The brilliant sun swept over my shoulders and I sprawled my bare aching feet out into the street, back up against my backpack. We had an hour to kill, nowhere else to be, and no real urge to be standing up, so we sat. No cell phone. It was nice to just be. That evening we found our way to the local, one and only restaurant for the Peregrino menu, as there was nothing else to eat, and awaited our elaborate 3 course mean inclusivo Pan y Vino. There were many tables with people sat down, and one lone man to serve them all. Food was magically appearing from the back somewhere, and each course was just as wonderful as the last! The one-man show wouldn’t havnt functioned so well for any other crowd. As worn out travelers, we are or have become quite patient. We wait in line for everything and even after just a week have realized the importance and greatness of a break. Of a moment to sit down without a pack. Our entire 3-course meal ended up taking about an hour and a half. The one- man running the show was clearly content with his life’s word. He set down each well-prepared plate with a content, knowing smile. Even as Kent exclaimed how wonderful y, “fantastico” the food was, he smiled with a sparkle in his eye. Perhaps, all the money put into this wonderfully brand new building and one restaurant was his life’s savings and he now finally accomplished what he had set out to do. How does one find such a contentedness in life? 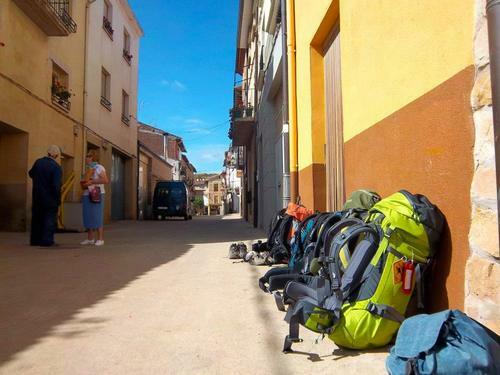 Although our time in the Albergue Privato has been lovely, due to expenses we will have to stick to the government run Refugio Municipals, which are always located near the church in town, and always nice enough. We really only need a bed and a shower, anyway.